Exclusively Ours!Running So Fast...With Puffs Of Smoke Coming Out Of The Bottom Of Her Feet! This Chick Is Hot, With Flames Of Fire Shooting Out At The Bottom Of The Charm! 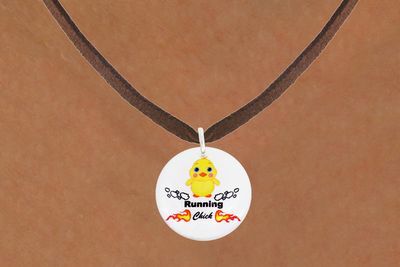 Lead & Nickel Free "Running Chick" Charm Comes On A Necklace Style Of Your Choice: Ball Chain, Regular Chain, Snake Chain, Black Suede Leatherette, Or Brown Suede Leatherette.